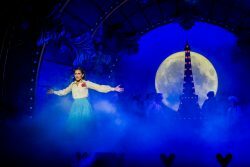 FANTASTIQUE is the only word for Andrew Pollard’s delightful and delicious version of Beauty and the Beast, on stage in Salis­bury until 13th January. He cut his teeth with Bath’s Natural Theatre, so there’s little Andrew doesn’t know about ob­ser­ving the public and adapting to their needs. And there’s nothing that Salisbury needs more than a dose of love and sugar this Christmas. Of course it’s pantomime, so it needs baddies, comics, lovers and a happy ending. Gabrielle- Suzanne Barbot de Villeneuve, who was born in Paris in 1695, is regarded as the originator of the story, which is all about not judging by appearances. The main storyline is about a beautiful girl (here Amorette) who falls in love with an ugly beast because she discovers that his soul and spirit don’t match his hideous exterior. It’s set in Paris, and in this version the deus ex machina is a pink Cupid, who, with his Cupettes, spreads fairy dust on a troubled world. Amo­rette has a younger sister, the self-absorbed, on trend, #MEE, Soufle´ (hilariously played by Nerine Skinner). 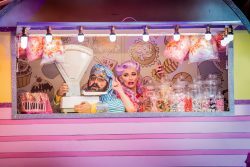 Their father, M. Marzipan, is a skint sugar dealer, and his best customer is Dame Betty Bonbon (a welcome return for the flamboyant Richard Ede), a sweetmaker who travels in a caravan of pastel confectionery. Helen Colby makes the very most of the evil Spite, guardian to (and spurned by) the Prince. 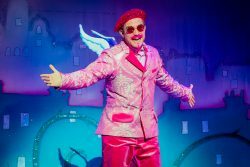 And on the side of good, the very French Cupid illustrates the best of what we might be missing with Brexit, in the energetic person of Alex Wadham. And in the title roles Liberty Buckland and Joseph Black capture the excitement and confused hesitancy of young love. 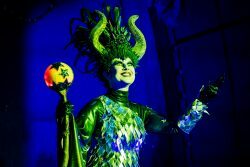 This team (Pollard, director Ryan McBryde and designer James Button) took home the Best Panto­mime of 2017/18 award with Salisbury’s Jack and the Bean­stalk. 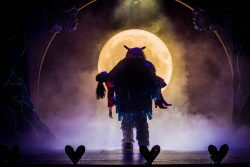 They will be a hard act to beat this year with one of the most charming and enjoyable pantos in many years. Posted in Reviews on 7 December, 2018 .